What: Leo Clubs are a youth organisation of Lions Clubs International. The word “Leo” stands for Leadership, Experience, Opportunity. When: In Roma we meet on the last Sunday of the month and have a sausage sizzle every once a month in front of Home Timber and Hardware, as well as become involved in local events. Why: The Leo Club gives us an identity, to be a part of something and give to the community. Alongside the social aspect of this local organisation, we can feel a sense of belonging and it’s always comforting knowing that you’re making a difference whether big or small! 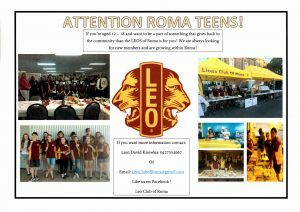 We encourage young people to become a part of Leos.